To view a list of patient payments that have been received, click the Payments tab , then select Received. 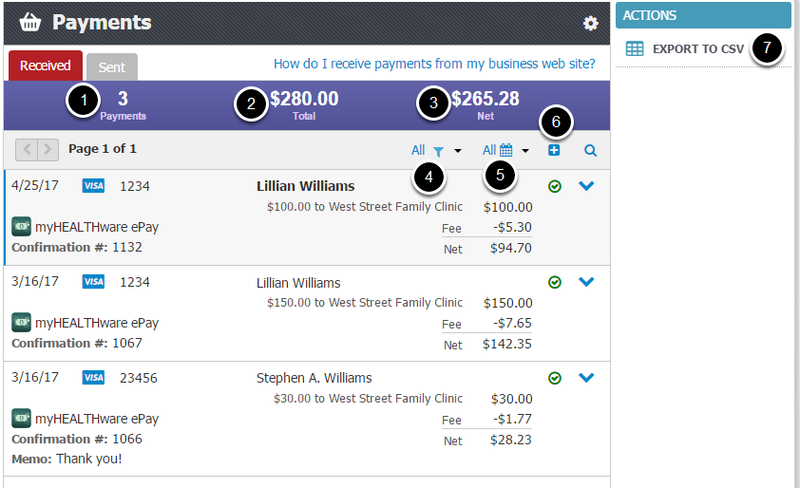 The Received tab will display all payments that have been received by the clinic. 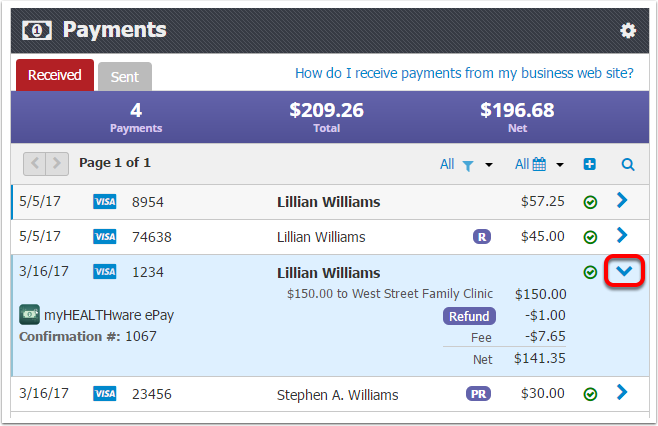 The top of the screen will display a summary of the patient payments that have been received. Payments: The total number of payments that are being displayed. Total: The total amount collected from patient payments. Net: The amount collected from patient payments after transaction fees have been applied. Filter: Filter your view of payments by All, Unread, and Archived. Date Range Filter: Filter your view of patients by selecting a date range. Options include: custom date range, all payments, today's payments, payments in the last 7 days, payments this month, payments last month, payments this year, payments last year, and payments in the last 12 months. Expand (+): Expand details of the payments displayed. Export to CSV: To export the payment list to CSV, click the Export to CSV button. Expand Details: Click the arrow to view payment details. Payment Date: The date the payment was submitted by the patient. Reference Number: The reference number that the patient included with their payment. This can reference the invoice number, statement number, or account number. Patient Name: The name of the patient who submitted the payment. Hover the mouse over the patient name to see additional details including the patient picture, DOB, and SSN. Payment Amount and Fee: Details of the patients payment amount and the transaction fee. Payment Status: Displays the status of the payment including "Payment Successful", "Payment Pending", or "Payment Failed". Confirmation Number: The confirmation number for the payment. View Receipt: View the receipt that was stored for the patients payment. 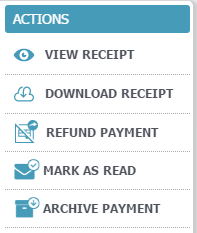 Download Receipt: Download the receipt to your computer. 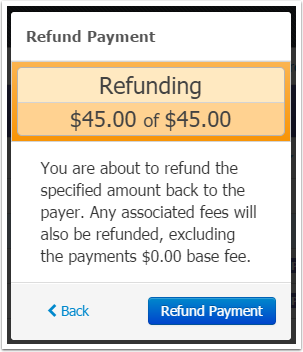 Refund Payment: Refund the payment to the patient. Mark as Read/Unread: Mark the payment as Read/Unread. Archive Payment: Move the payment to the Archive folder. 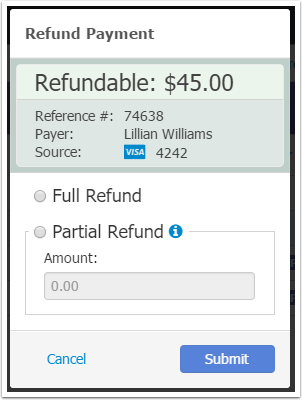 To refund a partial or full amount of the payment to the patient, click on "Refund Payment" in the Actions menu. Next, select either Full Refund or Partial Refund. If choosing a partial refund, enter the amount of the refund. *Note: Partial refunds are only available for payments made through credit or debit cards. You will then be asked to confirm the refund amount. Click Refund Payment to continue. The Refund Succeded screen will display. Click Finish. Refunds will display on the Payment list. The "R" symbol indicates a full refund. 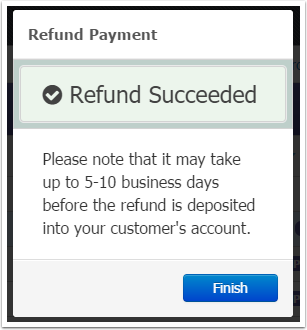 The "PR" symbol indicates a partial refund. To see the details of the refund, expand the payment details.